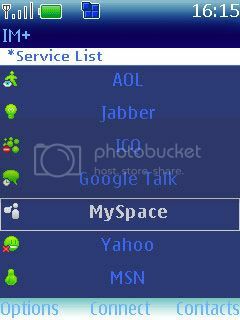 IM+ is all-in-one mobile IM client that enable you to send instant text to AIM/iChat, MSN/Windows Live Messenger, Yahoo!, ICQ, Jabber, Google Talk and MySpace directly from your mobile. peoplesound is a Mobile instant messaging applications, chatting, SMS notifications and the ability to share photos, links, and news instantly with your real friends. Works on Blackberry, iPhone, Java & Symbian phones. Communicate with all your friends in a single buddylist. Change user interface with different graphical themes. Set your own status to give your contacts an idea of your mood. Chat in portrait and landscape modes.